3 What Is a Cipollini Onion? 4 What Are Green Onions? How to Dice an Onion. When the recipe calls for a "diced onion," you may wonder if there's an easy way to do this. Read the following guide to learn how to properly dice an onion and you'll soon be dicing onions just as efficiently as a world class chef. Cut off the stem end of the onion, but leave the root end of the onion intact for now. Remove the skin layers of the onion. This is the papery feeling exterior of the onion. Peel enough of the outside or exterior layers so that your onion is smooth to the touch. Slice the onion in half by making your cut from the top stem area straight down through the root area. You now have 2 halves that have a flat surface to dice more efficiently. Hold one of the onion halves, pressing down on the cutting board with your fingers at the root end while you make downward slices parallel to the veins in the onion. You will cut ¾ of the way towards the root end, without cutting all the way to where your fingers are. Make these cuts or slices all the way across the onion. The space you leave between the slices depends upon how large or small you want your diced onion pieces to be. Wider spaces between slices will end up making larger diced pieces of onion. Take your hand and place it on top of the onion half that you sliced vertically. You will hold down the onion while using the chef's knife to slice into the onion horizontally or parallel to the cutting board or flat side of the onion. Again, do not cut all the way through the root end, as you need the root to hold the onion together. Again, the more horizontal slices you make into the onion, the smaller your diced onion pieces will end up being. 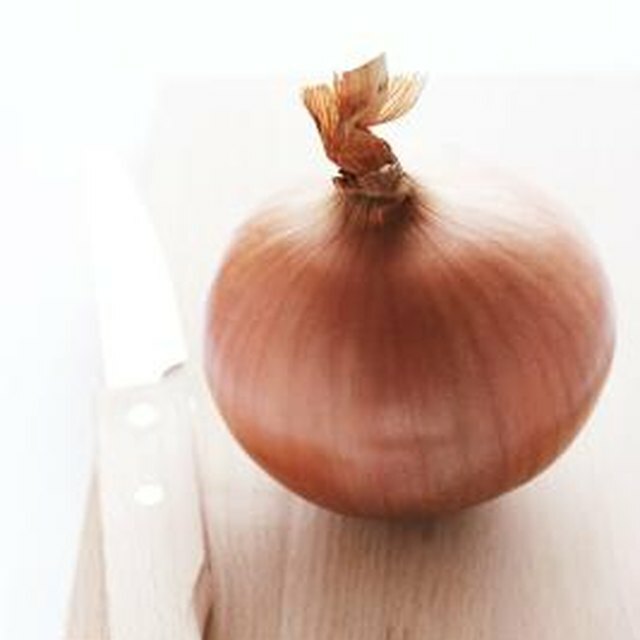 Turn the onion half where you can cut straight down across both the horizontal and vertical slices you have previously cut. The diced onion pieces will fall as you make each of these cuts. Continue this dicing cut all the way across the onion half. Make several final cuts and chops to the root end area of the onion to complete dicing that half. Repeat Steps 1 through 6 on the other onion half to have your entire onion diced to perfection. Watch the placement of your fingers while slicing and dicing the onion to avoid being cut.